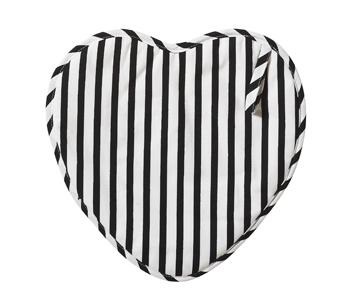 This fashion apron just deserves a big applause! Constructed with 100% cotton fabric and eyelet lace trim, this kitchen wear can go well beyond the kitchen. Whether you're a gourmet chef or can't boil an egg, nobody will ever notice when you're wearing this glamour apron! 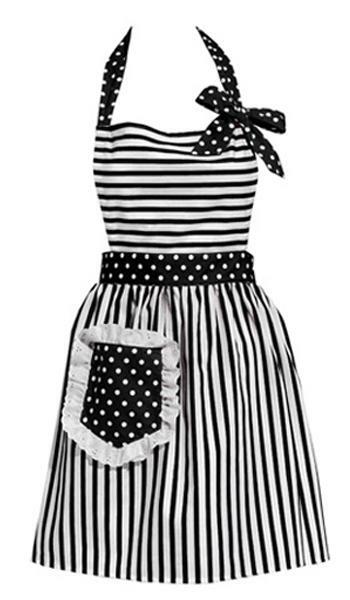 Of gourmet design, Dorothy Apron comes in a white background fabric with black stripes, beautifully contrasts with a one-hand polka dotted pocket with eyelace trim, polka dotted waist band and neck straps. Perfect match for the Dorothy Apron! With black and white lace trim.